Hi all! To put it mildly, I am having a day in which I feel very harried. I'm not saying that I'm justified in feeling harried, but I'm feeling harried. I have a lot on my mind this week, and thus am easily overwhelmed. It's not real pleasant, but I'm doing the best with it that I can. So what I've been focusing on are small tasks, staying patient, and prayer. The St. Monica novena begins today, and the chaplets page has been updated with a video introduction to her chaplet and an audio recording of the chaplet prayers themselves, with the novena prayer included at the end. And let me tell you, this particular recording is very much like you're right here in the room praying along with me. I'll explain, but first let me chronicle my morning up to that point. Do you have your tea? Good. Me too. So, this morning I was slated to ferry Henry to his allergist for an updated skin test. Fun wow, right? Especially for poor Henry. ;-) Since we didn't have to leave until 9 am, I made a quick trip to the pharmacy to pick up his asthma medication refills, and believe me, NEAR OCCASION OF SIN, right there. If nobody is going to pay attention to the drive up line, don't have one, kwim?! I ended up abandoning the drive up, parked, and went inside, where everybody was busily pretending that the drive up window and the waiting cars didn't exist. I KNEW IT. But I digress. I fetched Henry's medicine, and then hurried home to gather my work stuff and my son. I found him looking surly and not too eager about his appointment, not that I can blame him. He wanted to pack his small Nintendo DS to occupy him since the skin testing requires him to sit still for a time with the schmutz on his arm or what have you. Naturally, he had forgotten to charge it and an angry red light was blinking furiously. This did nothing to improve his mood. "I usually pray the rosary in the car, Hank. Want to pray a decade with me?" "You pray the rosary? In THE CAR?" Henry is clearly not yet indoctrinated into the Love To Pray In The Car! Club. But he was feeling amenable generally to my cause since I had saved his ability to play video games for the next hour. "Yeah! We have all this time, and it's very soothing. I'm on the 2nd Sorrowful Mystery. Do you want to lead or respond?" "Do you want to use my pumpkin rosary?! It's particularly smashing!" "No thanks. I'll count on my fingers." Spoil sport. But he prayed along really well, and I even talked him into praying the 3rd mystery too, since we had more than enough time. But the pumpkin rosary? Prepare to swoon! That's it there on the right, with the Madonna and Child centerpiece. It's my new fall rosary, and on the left is St. Francis de Sales, isn't he handsome as well?! I LOVE rosary beads. I may have a problem. Is there a 12 step program for rosary hoarders? So then we got to the allergist's office, and Henry had the thing, and the poor child is allergic to pretty much every living thing that he may encounter outdoors: grass, weed pollen, dust, trees, cats, dogs, feathers (even my beloved birds!! so sad). "Does this mean that I can't ever go outside?" "Yes Henry. You're going to have to walk around in a giant bubble." Henry does not look amused. I notice that my office neighbor is not in residence so I quickly get out my equipment and get down to praying. I have a private office, but the walls here are THIN. And, well. She is LOUD. She's a perfectly nice woman, but she is very, very loud. In everything that she does. Talking, sneezing, traversing her office, putting down her keys, see a theme here? And there's really no polite way to tell someone that they are a Loud Person, you know? They're just loud. They don't mean to be. But everything about them is loud. And so I really *need* her to be out of her office to record anything in mine. She wasn't there, I start recording, and BAM! I hadn't gotten very far yet, so I stopped recording. Because she had also started making other shuffling and chair dragging noises, and the effect really wasn't good. I ate my lunch and tried to wait her out. BAM! Eureka!! She left, hurry, hurry, hurry! I grab my beads and my audio recorder and get to work. 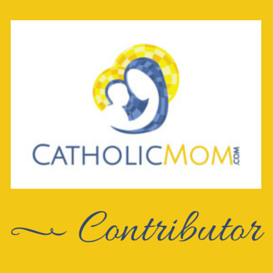 I get all the way around the chaplet, and am on the final few prayers when disaster strikes. So glad the novena started today. I really think she helped out with a big family problem a few years back. I haven't posted about it yet, but I had a big weekend because not only did I host a bridal shower successfully (grateful for all the help I got--I'm not really a party-thrower) but I also got a bridesmaid's dress. So not what I expected (not short, not a dark color, not happy about what size I had to buy) but when I saw the pleased look on my sister's face, that was enough for me. Now, to find shoes. . .
Kate, me too. I really needed it this week, a lot going on that I want to pray about! And bridesmaid dresses - God bless you. :) Been there myself - not the color and certainly not the style I would have picked (unless 'dowdy' was the look I was going for, which it decidedly wasn't ;-)) but when the bride is happy, we're happy. Congratulations to your sister! Cant't wait to listen to the audio and pray along with you. Great idea to include the novena prayers along with the chaplet. I was thinking of you this weekend while my children were making mischief in the pew during mass. This week I made it all the way until the end of the gospel before my son made a break for the aisle. My daughter is pretty good at staying with DH in church. DH is in Atlanta for a week for work, so I have the kids by myself. Lots of work, but it gives me a chance to do some things I would not ordinarily get to in the evenings. I probably could have prayed two rosaries during my commute this morning due to slower than usual traffic, but, after a certain point, I was not properly disposed to pray, if you know what I mean. 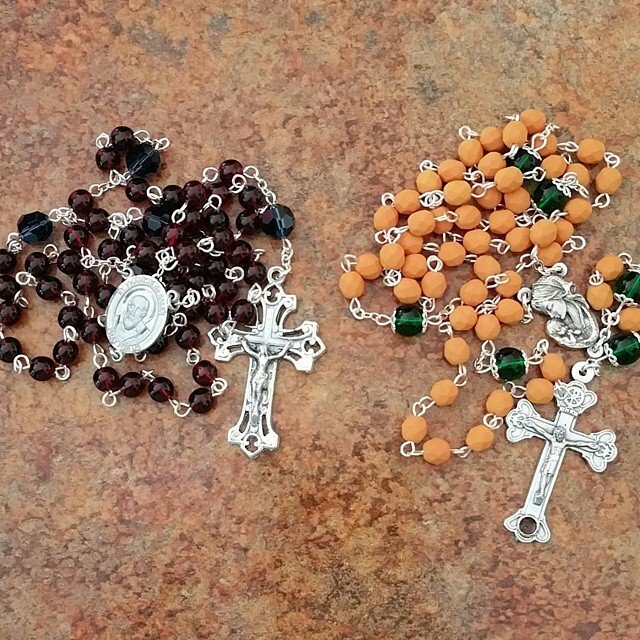 Your new fall rosary is lovely - I say if you can reasonably afford it, and if it is a means to motivate more prayer, what's the harm? Melanie, I'm so, so glad to have you praying along!